Today VMware released App Volumes 2.12, the next version of VMware App Volumes with a lot of improvements. Let me take you through the changes and improvements in a short article. If you want to read the announcement from VMware you can find it right here – link -. It even has a quote from my customer, a happy App Volumes customer. One new feature is the option to be able to deploy your VMware App volumes 2.12 AppStack to multiple domains even if they are not trusted. You can register multiple domains where you provide different credentials for each domain. This makes it easier to deploy from a central location and be able to provision for multiple domain if a customer has multiple domains. Support for non trusted domains, here you will use an account with read privileges to the domain. with VMware App Volumes 2.12 trusted domains will be come individually configured AD entries in the manager. A good improvement I think. Another new feature is the detection of the nearest domain controller with the best response time. The manager will generate a ordered list of the available Domain controllers and pick the best one for you. Benefits of this are the improved performance as you will get the best performing Domain controller and don’t need to travel over a WAN. 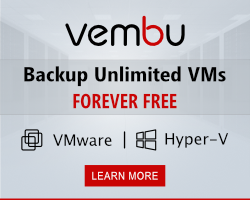 It improves fail-over capabilities as you will get the best performing Domain controller and if yours fails the next one available wil be assigned. How do you configure this? Below is a screenshot of the configuration of the smart domain contr0ller discovery and routing within VMware App Volumes 2.12. 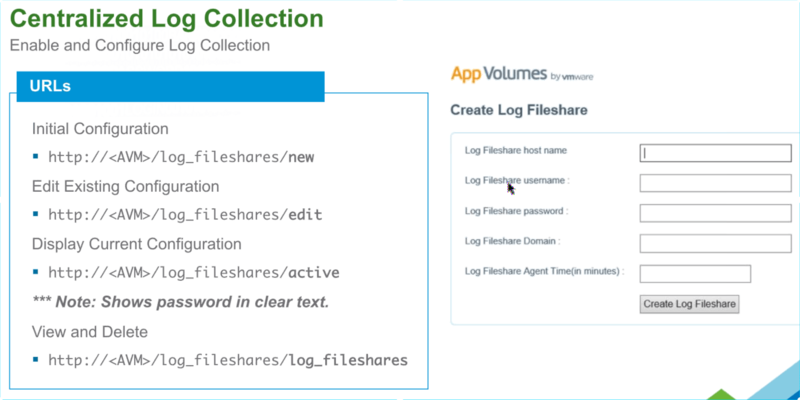 The third announcement with VMware app Volumes 2.12 is the option the create a centralized log collection. You have an overview of all the agents and what is going on with the VMware App Volumes 2.12 AppStacks. If you wonder how you can configure it, below is a screenshot of the configuration. The remote file share path must end with a folder called LOGS. Since VMware App Volumes 2.12 Microsoft Windows 10 build 1607 CB, CCB and LTSB are supported. Also Microsoft Office 2016 can be deployed with an appstack from this version. Not sure anyone will deploy Office with an appstack but perhaps a single app is a use case. With the VMware App Volumes 2.12 a huge improvement has been made with the performance. When working with Windows 10 you need this extra performance for sure, so the 30-50% improvement there is a welcome fact. not gonna say that much about this but there are a few security updates as well in VMware App Volumes 2.12. Ruby engine has been upgrade tot version 2.2.5, this is the App volumes manager engine. it also enables updates to libraries. Another one is the option to replace the self signed certificate of the App Volumes manager with a CA-signed one. This will help to get rid of the untrusted message. The certificate will be trusted by the App Volumes agent when it is CA signed. Also you can encrypt the connection with the Microsoft SQL server. The encryption is on the SQL server instance so if you have clustered environment this will affect all the databases on that cluster. Take this in to mind as you don’t want to break other databases. The SQL Service account has to have read privileges to the SQL certificate to function properly. Another thing is that you now can accept the self signed vCenter certificate. I’m pretty sure that they enabled this as the certificate of a VMware vCenter server is pretty damn hard to get replaced. So somehow this is a good idea but a better idea is to make Certificate replacement of vCenter easier. I’d rather have a good certification in place than accept this self signed. It is a short article but I hope you got an overview of what is coming… more to come for sure. oh yeah and last but not least, VMware vSphere 6.5 is supported.